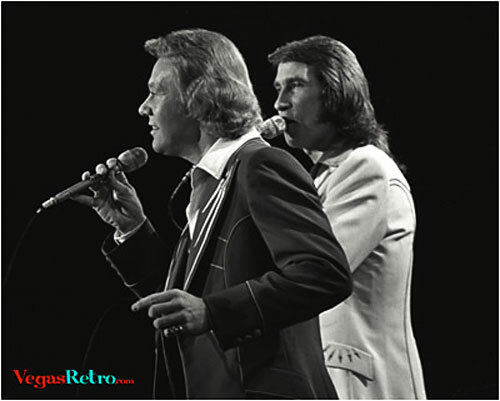 Bill Medley and Bobby Hatfield performing on Sammy & Company, Sammy Davis Jr.'s talk show filmed in Las Vegas in 1975. The Righteous Brothers were brought to prominence in 1965 with their hit single "You've Lost That Lovin' Feeling". The song holds the record for the most played song in radio history. The two split up for several years, until they appeared back together on the Sonny & Cher Show in 1974. This Las Vegas performance was likely part of their comeback tour.